Thanks to Justin Woolliscroft for sending through details of a Guardian article. 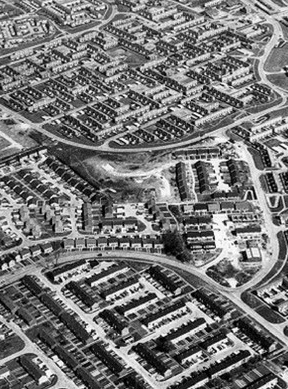 It describes the changing fortunes of the Bransholme estate in Hull. Bransholme was where I started my secondary teaching career when I was doing my PGCE course at the University of Hull in 1986. I remember the High school, which has undergone various new buildings and name since. I remember walking to Bransholme Centre, where there were some shops, and I used to catch the bus back to the area where I lived at the time. I'd had 3 weeks in a Primary school in Withernsea first, and then we started in January 1987: thirty years ago... with our main teaching practice. I've started a much delayed Vademecum project as part of thinking back to that time. I spent the next three months or so working there for most of the week, in what I think is now the Winifred Holtby Academy. This was at a time when the fortunes of the estate were at a low ebb, and the school I remember as a place of routine and refuge for many children, with plenty of music and dancing in the corridors. In May this year, the estate has its 50th birthday, and as part of Hull's City of Culture tenure there are various events planned, and already taking place.